Ever wondered how those people look like, those who cheer you up way early in the morning while you drive to college / work... ever wondered how those radio announcers look like, those that drive you home in the late afternoon and those who accompany you when you are lonely at night! 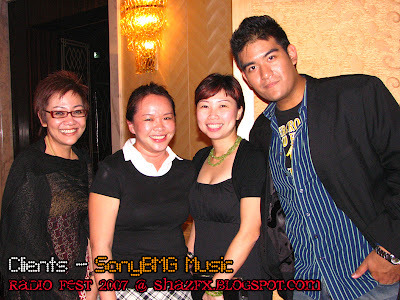 Well in this blog post you will have the possibility to see the pictures of some of Malaysia's famous Radio Announcers!!! 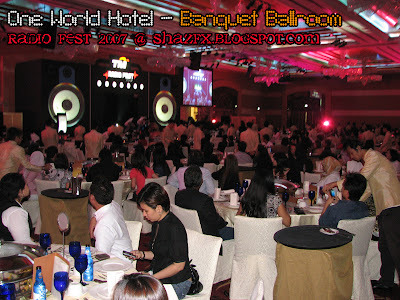 Radio Fest 2007, a 2 days conference held at One World Hotel and ended with a big bang cocktail reception and 9-course dinner at the Imperial Ballroom of the newly built One World Hotel here in Petaling Jaya. 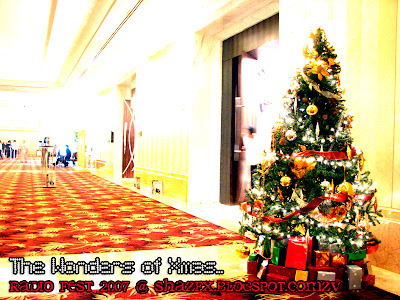 There were a lot of tables... and yes each and every one of them are fully occupied!!! 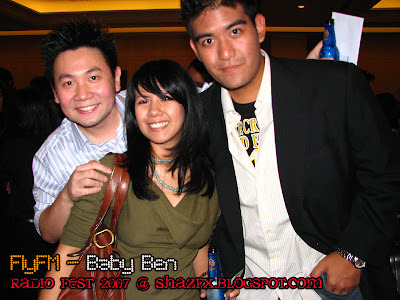 Former colleague from hitz.fm is Baby Ben who is now on FlyFM!!! - he was my mentor!!! sort of, the one who's shown me what it's like in the entertainment industry! Nadia Mishmoore and Aliff, used to be at Xfresh... now with Fly FM!!! 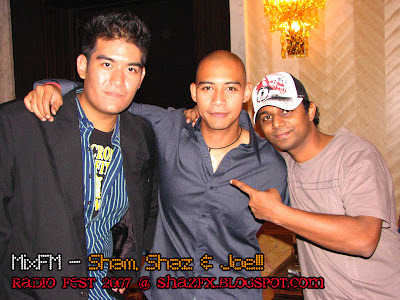 Colleagues from all different angles and places... Samir from hitz.fm, Reza from eraFM, and me!!! Radio Networks...we have friends everywhere!!! Tonight, its all about the FOOD!!! 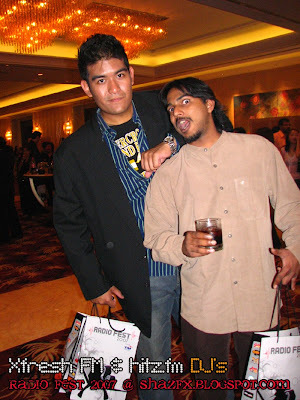 Jay of MixFM used to be from hitz.TV!!! Awesome dress!!! My colleagues from THR Raaga and Gegar!!! Inclusive of their morning crew!!! 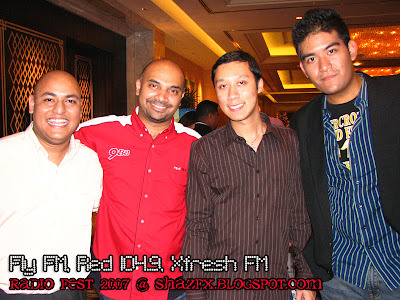 Mix FM DJ Sham and myself!!! We're all very simple people!!! My clients from SonyBMG Music!!! Known them since like 2001!!! Jeyaram aka Junior of hitz.fm!!! He's one BUSY guy!!! Adam C of hitz.fm and Jack Lim of MyFM!!! 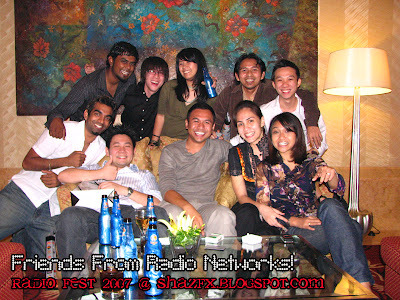 Radio Announcers from Malaysia's #1 Radio Stations! 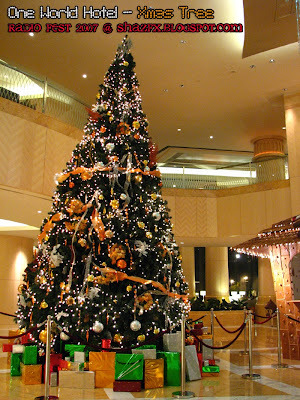 The colors of Xmas, its bright light...shining us in all we can!